So Justin has been cooking dinners lately. I know, I know, I’m spoiled. He’s trying to allow evening time for me to go to the gym or take a yoga class. Did I already mention that I’m spoiled? Anyway, it’s fun to see what recipes he picks out. It’s like going to a restaurant that has only one menu item – which I happen to LOVE. I love it when the chef takes away my choices and tells me, “This is what I want you to taste today.” That’s how I feel every night that Justin cooks. “This is how I’m going to nourish you today.” Happiness. Anyway, he chose this dish from the great cookbook I always mention, and I was surprised. Casserole? Cream-sherry sauce? Okay! It was really, REALLY good. 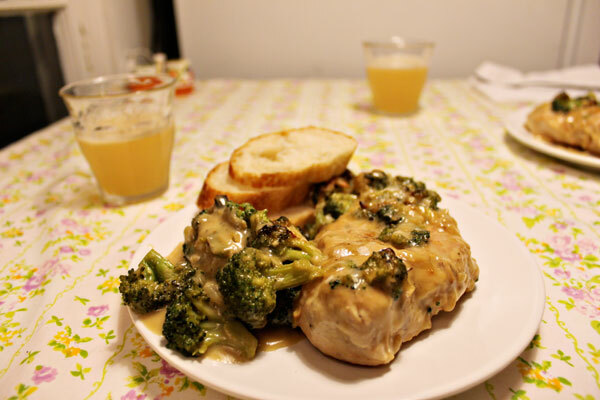 He even cooked the broccoli a bit more than crisp-tender, because we both like it super-cooked. The sauce is so good, too! So while Justin makes dinner, I’m in charge of cocktails. This time I made us a Pegu Club cocktail: 1 1/2 ounces gin, 1/2 ounce Paula’s Texas Orange, 3/4 ounce fresh lime juice and 2 dashes Angostura bitters. Shake with ice, then strain and serve. Mmmm. Pat chicken dry with with paper towels and season with salt and pepper. Melt 1 tablespoon butter in a large nonstick skillet over medium-high heat. Cook chicken until golden brown, about 3 minutes per side. Transfer to a plate. Add remaining butter and onion to empty skillet and cook over medium heat until onion is beginning to brown, about 2 minutes. Stir in flour and cook until golden, about 1 minute. Whisk in broth, cream, and sherry and simmer until thickened, about 3 minutes. Return chicken to skillet, reduce heat to low, and simmer, covered, until chicken is cooked through, about 15 minutes. Transfer chicken to baking dish. Meanwhile, microwave broccoli, covered, in bowl until slightly softened, 2 to 4 minutes. 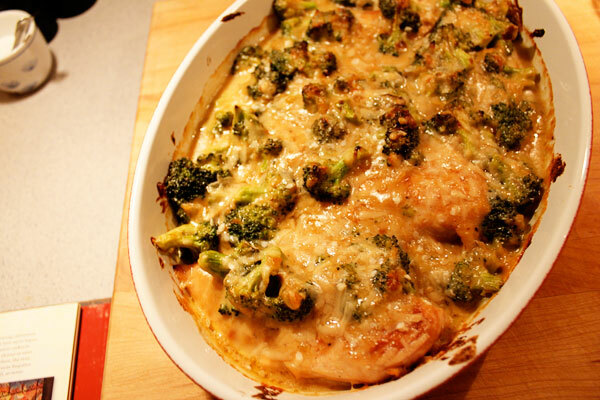 Add broccoli and 1 cup cheese to skillet. Season with salt and pepper and pour broccoli mixture over chicken. Sprinkle remaining cheese over top and bake until browned, about 10 minutes. Definitely a keeper! *drooooling* thanks so much for the recipe, gonna have to get my hubby to try this one since he is head chef right now while I’m in recovery from surgery. :) Hope you’re having a fabulous day! Oh, I hope you’re recovery is quick and restful (and tasty!). Question! The broccoli is bad news for me.. is there another green thing you can recommend? Maybe Asparagus? I’ve got to stay away from most leafy greens (like greens or spinach)… So random, I know! We used fresh. You could probably use frozen – I’d just thaw it out and warm it up before mixing in with the sauce. Spoiled indeed! Don’t you love men who can cook or what! Broccoli imported from the US is cheaper than Japan-made. So bizarre. Yes! And, that’s crazy about the broccoli.